Rip DVD Contents to 300+ Formats on Mac TuneFab DVD Ripper offer 300+ output formats. You are free to select anyone of it and rip your DVD contents to certain format as you like. Edit Ripped DVD Videos Freely When you have ripped the videos from DVD, you are able to edit or modify the videos with TuneFab DVD Ripper in your preference, then save to the local folder on your Mac. Up to 6X Faster Conversion Speed Don’t worry that you have to spend a lot of time to wait for the conversion done. TuneFab DVD Ripper enjoys a rather good reputation on its performance that it can rip DVD contents with up to 6X faster conversion speed. 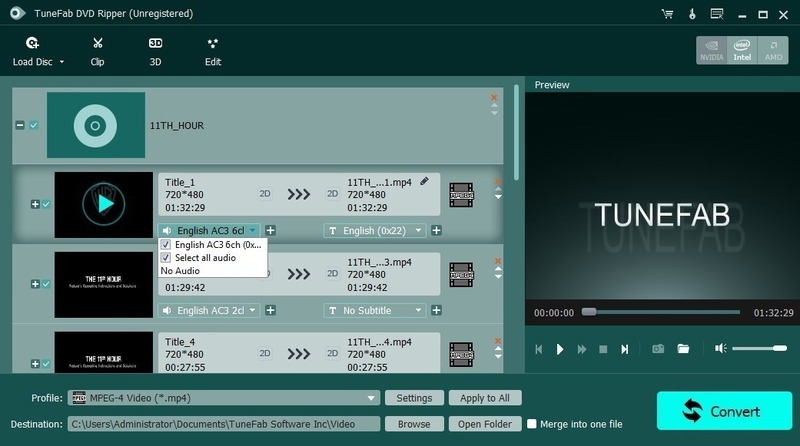 Preserve Audio Tracks and Subtitles Have you ever attracted by some sound tracks of the movie stored in DVD? With TuneFab DVD Ripper, you can not only easily rip video from DVD but also save the audio tracks and subtitles you prefer.